This is the week for salads. 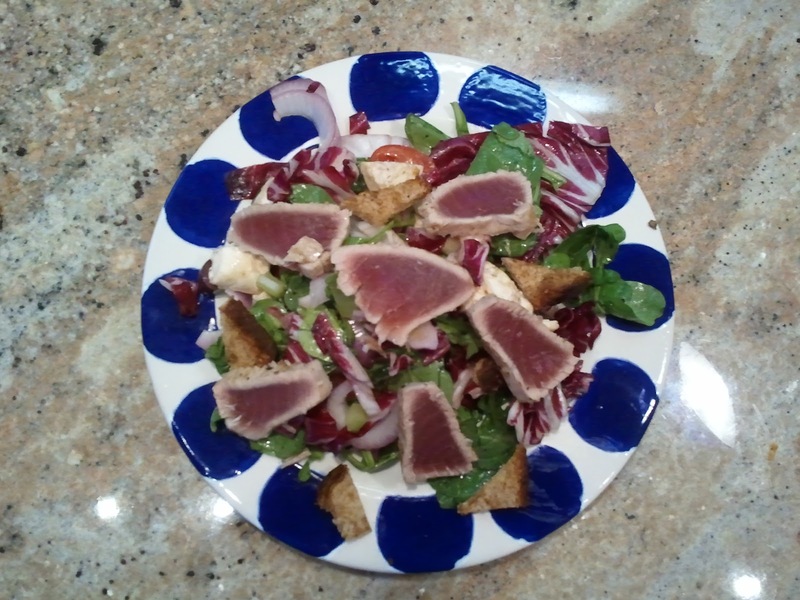 It is summer time and when it is hot outside there is nothing better than a salad to cool you down! I also especially like them for lunch since they can tend to be lighter in calories, saving some for afternoon snacks or a bigger dinner. This was yummy with bocconcini, kalamata olives, cucumber, red onion and seared Tuna. You can find the recipe in Now Eat This! Diet by Rocco Dispirito on page 157. Only 278 calories. 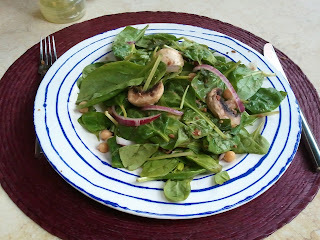 This salad was also a winner. 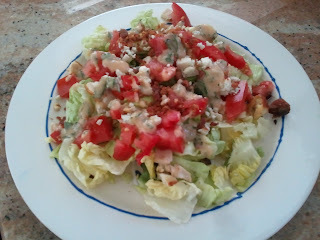 It was filled with a variety of ingredients from grilled chicken, avocado and bacon bits to heirloom tomato, crumbled blue cheese and scallions. You can find it in Now Eat This! by Rocco Dispirito on page 57. Only 235 calories. This salad may look like the simplest of the salads but is in fact filled with delicious ingredients like mushrooms, red onion, garbanzo beans and bacon bits. What makes it really tasty is the warmed dressing. You can find the recipe in Now Eat This! Diet by Rocco Dispirito on page 151. It does have the least calories with only 226 calories. There are many more to try like Boston Blue Chicken and Apple Salad (NETD p 160/294 cal), Sliced Steak with Tomato and Spinach Salad (NETD p 149/224 cal), Chinese Chicken Salad (NET p 59/221 cal), Lemony Shrimp Salad (NET p 61/175 cal) and Skinny Chef's Salad (NETD p 65/245 cal), to name a few. I will keep you posted!